With summer almost over and the August heat droning on, the rising temperatures can cause more than discomfort. Although we can see the finish line of summer, high temperatures can last well into September. As the thermometer goes up here are a few tips and tricks to ward off sunburn, sweat and heat exhaustion. Another important component to beating the heat is making sure your body has plenty of water. In the summer our bodies sweat and in order to stay properly hydrated, we need to take in as much fluid as we sweat out. A good idea is to buy a reusable water and carry it with you throughout the day. If you start to become overheated and want a quick way to cool down, know your bodies cooldown points. Cooldown points are places on your body where you can put a cool cloth and can bring down your body heat more efficiently. This works best on your wrist and neck because they are your pulse points. Simply put a cold paper towel or ice wrapped in a towel to this points. You can also do this to the insides of your elbows and knees. When you cook inside heat from ovens and stoves can cause your house to collect unnecessary heat inside your home, and if you don’t have an air conditioner the excess can make a huge difference in the temperature of your home. To avoid this you can cook outdoors on the grill or cook a meal that can be easily reheated and repurposed for dinner the next night. Another tip on how to avoid excess heat in your home is keeping your windows open at night to let the cool air in. Last but not least not yourself and your body, if you become so hot you feel sick it might be time to go inside or seek help. Also, remember in extreme heat is to never leave dogs or children in a parked car with the windows rolled up. 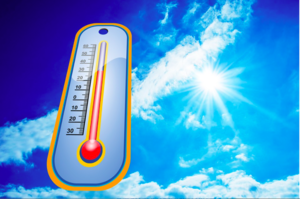 Another thing to remember is to take it easy during the hottest and sunniest parts of the day because at these times of day you are at increased risk of heat exhaustion and sunburn.